After the better part of a year, I’m ready to face my only big mistake of a brew. I had originally planned this as the other face of Colleen’s beervatar, a duo of low gravity beers that would suit themselves to the season just as the seasons so closely govern Colleen’s own tastes. However, since Colleen didn’t care for the first of those two brews, I’ve left her to claim rights to whichever brew of mine suits her fancy. Instead this beer finds itself installed in another series, my developing seasonal porter series. Starting in the autumn with Peanut Porter, we come now to Coffee Porter for the winter. In addition to the oats, S-04 is a relatively low attenuating yeast, so I am hoping for a beer with a nice full body. However, at the last homebrew guild meeting, we reviewed two examples of oatmeal stouts and neither displayed the slick oatmeal fullness that is supposed to be characteristic of the style, so who knows what will result. The current plan is to crush (not grind!) the coffee beans and then add them to the fermenter one day before I plan to bottle. Brew day went very smoothly. I had undershot my mash temp on my last few small brew-in-a-bag batches, so I used the grain weight, mash volumes, and temperature drops from those brews to calculate my needed strike temperature. It came in at a whopping 174 degrees F. After doughing in with plenty of stirring to thoroughly wet the grain, I found I’d hit my mash temp of 153 F. However, after stirring up grain from the bottom, I found that the temperature of the mash was as high as 168 degrees F in spots. I added a quart of cold water from the tap, which brought me back down to 153 F when thoroughly stirred in. After that excitement, I let the mash sit for 50 minutes, and then added my dark malts. After another ten minutes, I heated the mash for 5 minutes while stirring, removed the bag and sparged with water hot out of the tap, squeezing the bag for all it is worth. In the end I collected a little less than my target 3.8 gallons of wort but at a little higher gravity than my target of 1.047. After the boil was all done, it I ended up with 3 gallons of 1.054 wort, a few points shy of the 1.057 I was anticipating (which is already on the low side). It’s possible that my mash mishap hurt me, but I’m not worried about a three gravity points. The wort was viscous and sticky, so I’m already excited to see how this beer ends up. I might finally been on the path to a stout worth sipping. 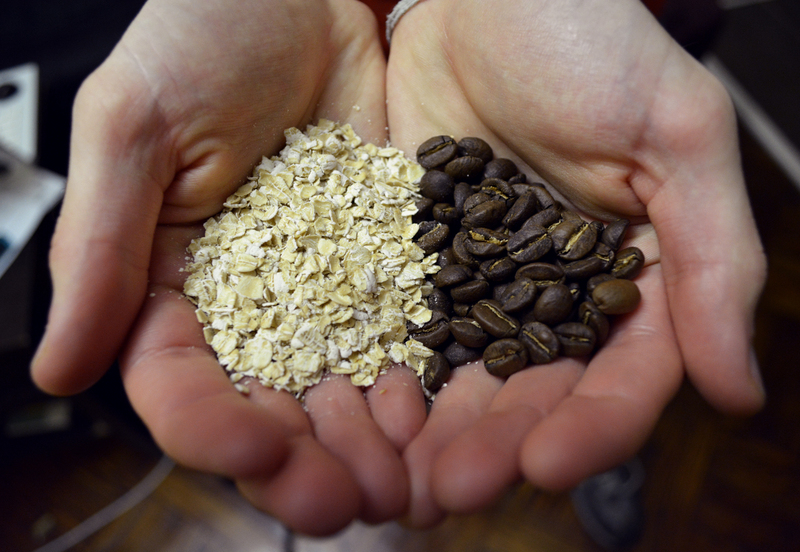 This entry was posted in beer, brew day, recipes and tagged coffee stout, oats, otameal, stout on November 27, 2013 by Dylan Bargteil.